Sega has been in an awkward spot with the Sonic series for years. Three-dimensional titles like Sonic and the Secret Rings and Sonic Unleashed perform well on store shelves, but are lambasted by critics. While the new post-Sonic Adventure titles have found a wide audience with younger gamers, longtime Sonic veterans such as myself yearn for the glorious 2D days. Sonic Generations’ strives to deliver the best of both worlds, and my brief spin through Green Hill Zone helped restore my faith in the inconsistent series. Similarly to Sonic Colors, Sonic Generations delivers both 2D and 3D gameplay in one package. Instead of swapping between dimensions in a single level, however, the unique perspectives are split into separate stages. But there’s a catch – the two gameplay types are represented by modern and classic versions of Sonic. This paradox is the result of a mysterious new evil tearing a hole in the time-space continuum, and the two hedgehogs must unite to find out who is behind it all. The green-eyed Sonic introduced in Sonic Adventure cruises through the 3D levels, and the side-scrolling stages mark the long awaited return of Genesis-era Sonic. It’s an understatement to say I was excited to see an HD version of the short, stout, black-eyed Sonic I grew up with. If you played Sonic 4, you’re aware that Sega’s previous attempt to emulate Genesis controls was floaty and awkward. You can throw out those concerns. Aside from a hot-buttoned spindash, classic Sonic controls just like you remember. Leaping across platforms feels tight, and the sense of inertia is spot-on. After multiple playthroughs of the brief level, I looked down at the modern controller in my hand and was surprised not to see a Genesis pad. Stepping into the bright red sneakers of the lanky, wise-cracking, modern Sonic is similar to playing any of the recent Wii games. These streamlined rollercoaster segments don’t usually do much for me, but the level I played was a riot. Sonic has all his new tricks at his disposal, such as boosting, rail-grinding, and homing-in on enemies. Nabbing rings and killing badniks builds up Sonic’s boost (borrowed from Sonic Colors), allowing you to blaze through loop de loops as the catchy Green Hill Zone music quickens. 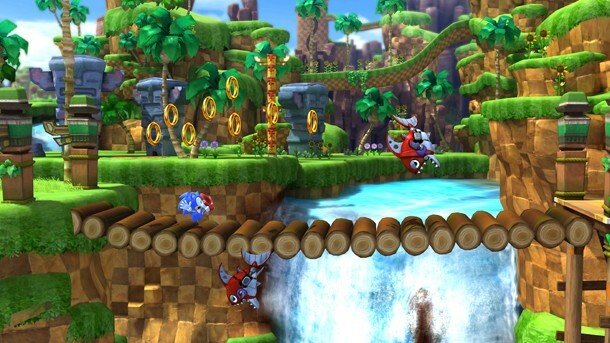 In one section of this branching course Sonic leaps through a waterfall onto a rail that he promptly grinds. A gigantic robotic fish then springs from the water below, chasing the hedgehog down in a scene reminiscent of the Sonic Adventure’s whale chase. Whether it was called Emerald, Mushroom, or Splash Hill Zone, gamers have played Green Hill Zone dozens of times. Despite the repetition, Sonic Generation’s iteration of the iconic stage trounces them all with lush backgrounds packed with waterfalls, greenery, and the most fluid platforming layouts yet. The 2D and 3D versions of the stage are entirely different, but both take full advantage of the Xbox 360 and PlayStation 3’s hardware to produce stunning visuals that will make Sonic fans lose their rings. Sega says you can look forward to revisiting your favorite Sonic stages from the Genesis, Dreamcast, and modern games in all their remixed, high definition glory. Every Sonic game is an opportunity for Sega to put the stethoscope to the fanbase and gauge their enthusiasm. Sega appears to have diagnosed many of the problems that have plagued the series for years, and a remedy may be in sight. I loved my first dose of Sonic Generations, and I’m ready to discover what else is in store.